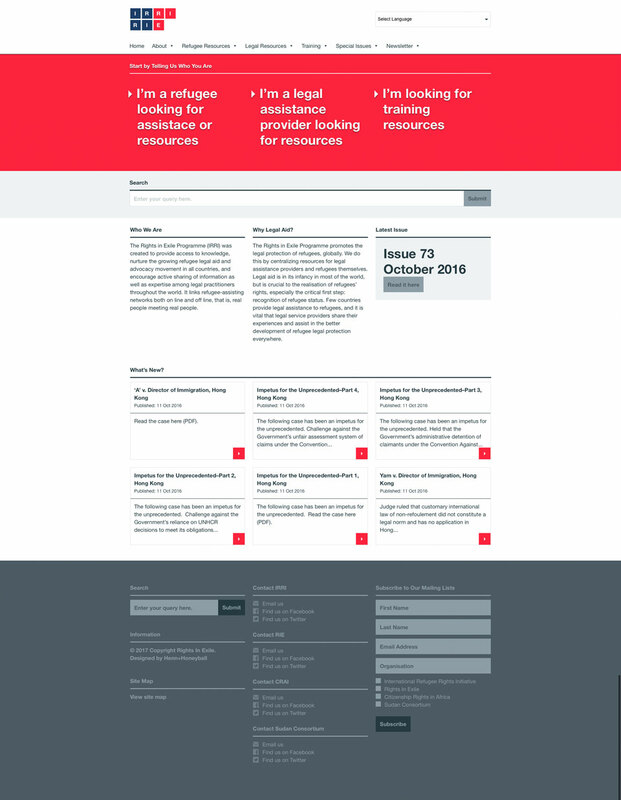 The home page has 3 editable areas: the red feature area which helps people to navigate to the section of the site they need; the text below “Who We Are” and “Why Legal Aid”; and the “Latest Issue” area. 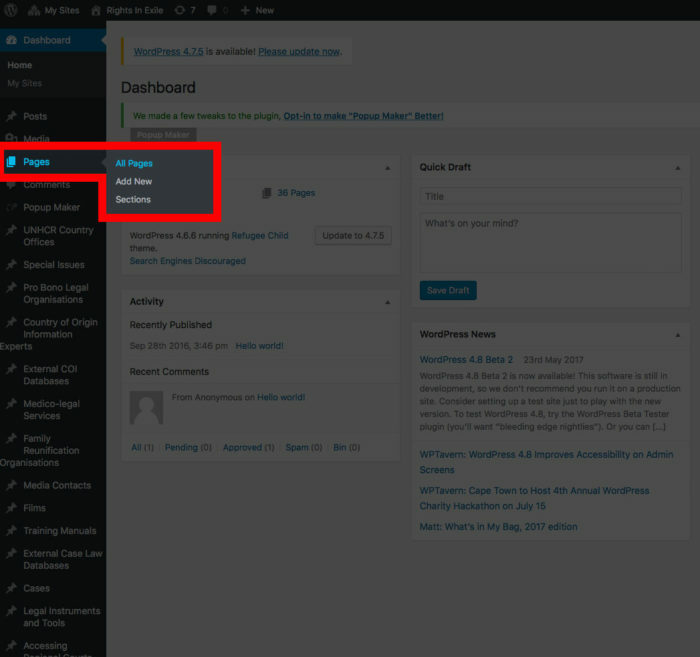 To edit the home page from the dashboard find the pages menu item in the menu on the right of the screen. 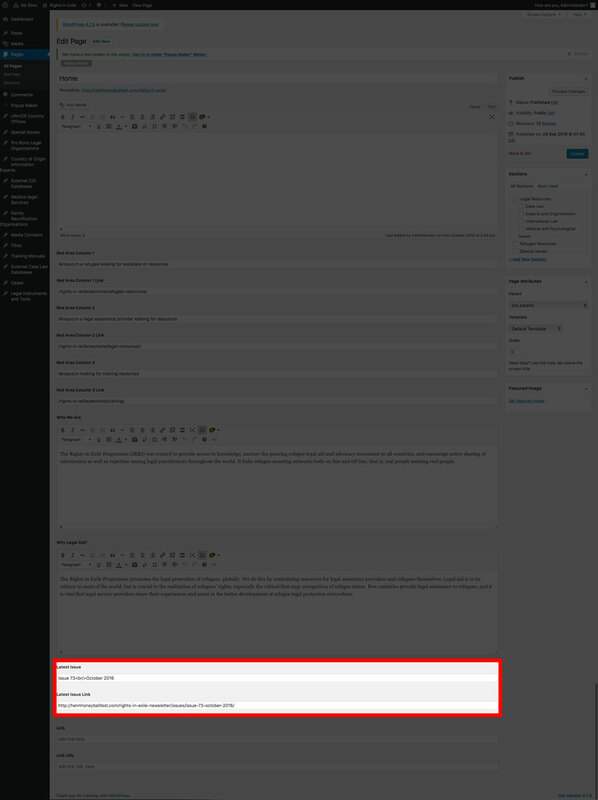 On hover a sub-menu will appear. Select “All Pages”. 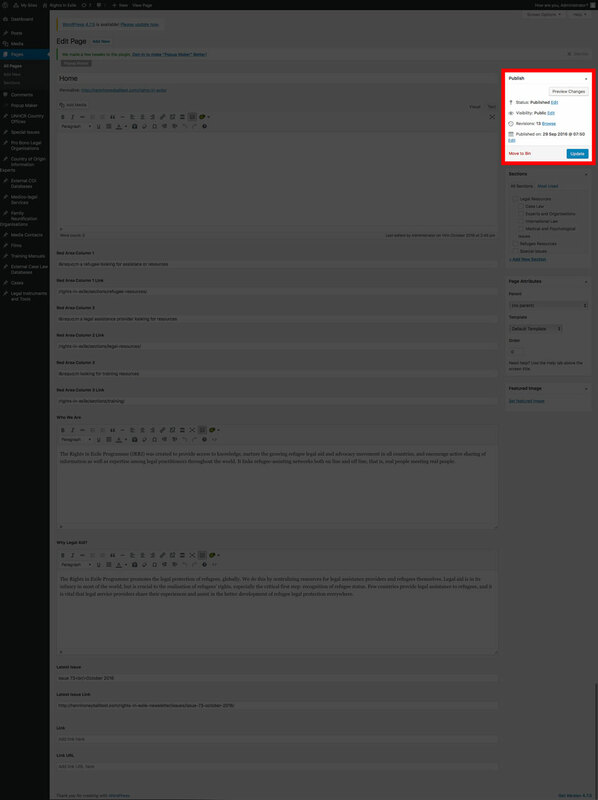 This will bring up a list of pages on the site. Find the “Home” page by either scrolling through the list or by searching for it with the search bar in the top right corner. To enter the edit screen click on the title or the “Edit” link below the title. At the top of the edit screen you will see the title input and the standard WordPress text editor. We advise against changing anything in these two inputs. 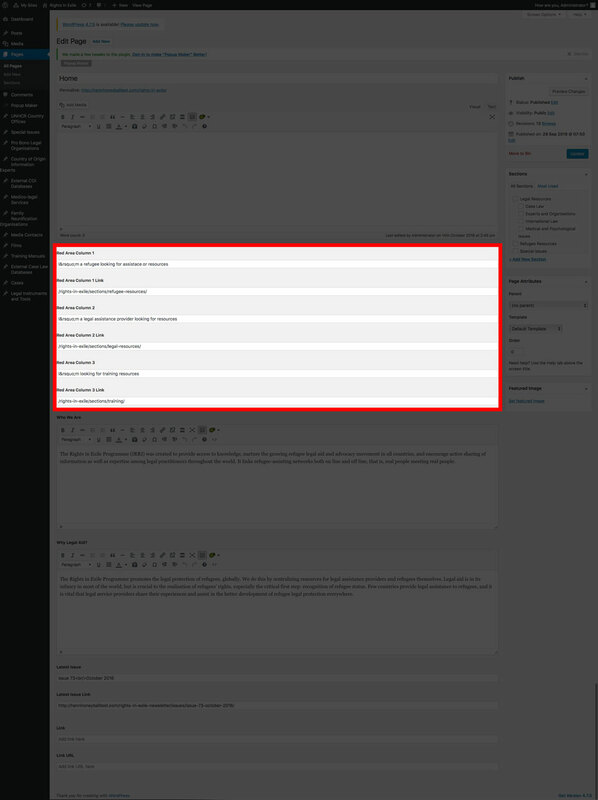 Below the text editor is an input labelled “Red Area Column 1”. That is where you can change the text in the first column of the red featured area. Below that is the path to the Refugee Resources section of the site. There are two more editable columns below that labelled Red Area Column 2″ and Red Area Column 3″ respectively. As you can guess these inputs are where you will edit the text and paths to their corresponding sections, namely Legal Resources and Training Resources. 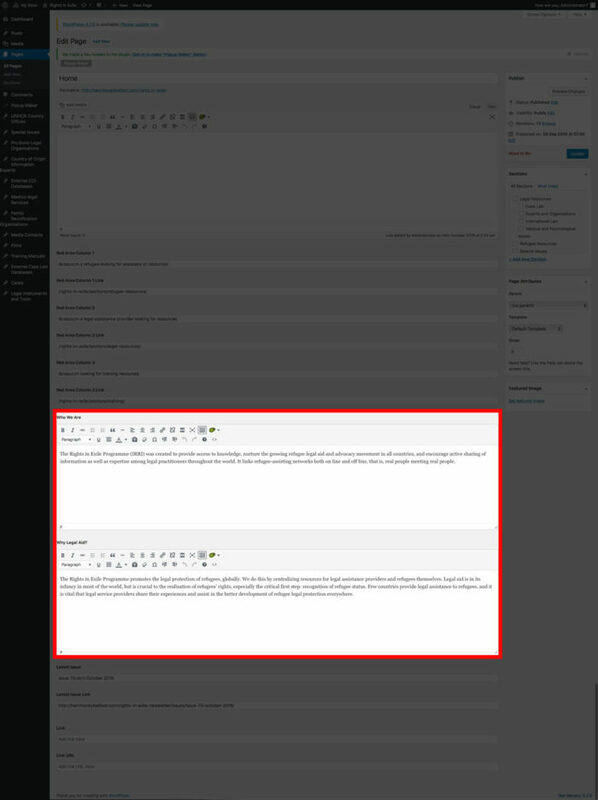 Below the red area columns is a text editor labelled “Who We Are”. This is where you can edit the description of Rights in Exile on the home page. Below that is another text editor labelled “Why Legal Aid?”, which is where you edit the text for the corresponding area on the home page. 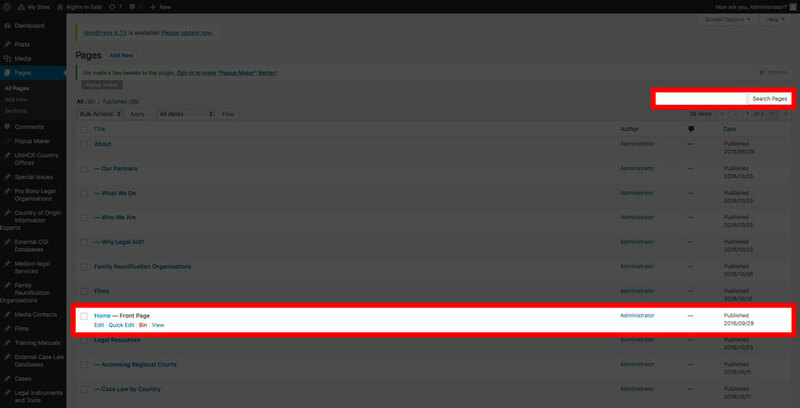 Lastly there are two inputs that control the “Latest Issue” area. This will link to the latest issue of the newsletter. The fist input is for the issue title and the second is for the link to that issue. Once you have finished editing you can choose to either save your edits as a draft by clicking the “Save Draft” button, or you can commit the changes to the live site by clicking the blue “Publish” button.